The Menu Express printed Booklet Menus. At The Menu Express, we specialize in pizzeria, restaurant menus and direct mail marketing. We have an extensive library of high quality food graphics. 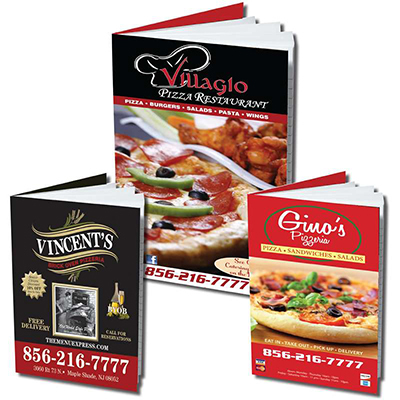 For fast menu printing, choose one of our ready-made designs, design your own menu, or have The Menu Express design a custom menu for your pizzeria, restaurant, bar or catering service. To request your quote for Booklet Menus, simply complete this form!